This crepe recipe is simplicity itself. The batter can be whipped up in just moments and set aside until you are ready to prepare the dessert. For best results, you will need a well-seasoned crepe pan or omelet pan. Dimensions may vary — for example, my crepe pan is 7 inches (18 cm) in diameter at the bottom and 9-1/4 inches (24 cm) across at the top. A smaller pan will of course produce smaller crepes, and vice versa. Here’s a key: The pan needs to get good and hot before you add the crepe batter, so do not rush it. As for the strawberries, it’s best to slice them at the last minute. The amount of sugar to add depends on the tartness of the berries. My method: add some, taste, and if necessary add some more. Pour the flour into a medium-sized bowl and make a well in the middle. Crack the egg into the well. Stir briefly with a spoon — the mixture will be sticky. Add 1/3 of the milk and stir. The mixture will still be a little lumpy. Add half of the remaining milk, set aside your spoon and whisk the batter with a wire whip. Add the rest of the milk and whisk again. Tiny lumps may remain. Don’t worry — this is normal. Add the vanilla and salt. Mix well. Set the batter aside to rest for at least 5 minutes. Rinse the strawberries, remove the tops and slice rather thinly. Place the slices in a bowl, add the sugar and stir. When ready to make the crepes, put 1 tsp. butter in a crepe pan and heat to sizzling. Spoon in a ladleful of batter — how much depends on the size of your crepe pan, and at first a little trial and error is necessary. Swirl the pan to coat the bottom evenly. It should be a thin layer, but not too thin or the crepe will break. Turn the heat down to medium-high and cook until the edges pull away from the pan, about one minute. Delicately flip with a spatula. Cook another 30 seconds or so and remove to a plate. Continue in this way, adding more butter to the pan as necessary and piling up the crepes, until you’ve used all the batter. To serve, place each crepe on its own dessert plate. 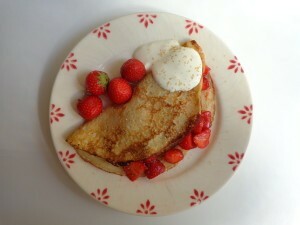 Spoon a couple tablespoons of strawberries over one-half of the crepe. Fold the other half over the strawberries. Add a dollop of cream or Greek yogurt. Sprinkle with a little extra sugar and add some whole strawberries for garnish. Serves 6-8. J’adore cette récipé! J’ai fait le crêpes et ils sont été très délicieux! Mes crêpes eu le Nutella est creme! Le crèam fraîche est un plaisant touche! Je change l’additions, mais je voudrais essayer ta exacte récipé un jour!